My brother Cham Giobbi and his wife Laine were with us when we first discovered there were porcini mushrooms growing in the West Elk Mountains. Cham made this delicious fettuccine that same night. Heat the oil in a large non-stick skillet over a medium heat. Add the onion and garlic and cook until the onion becomes translucent, about 5 minutes. 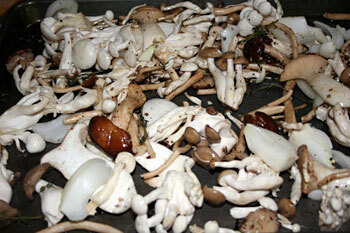 Add the mushrooms and cook them until their liquid cooks out, about 15 minutes. Add the soy, sugar, and salt. Cook the mushrooms for 2 minutes more and then set aside. Bring a large pot of salted water to a boil. Add the fettuccine and cook it until it is almost al dente, about 10 minutes. Drain the pasta and add it to the mushrooms. Add the warm chicken stock, the lemon juice and zest, and the butter. Toss the pasta, cooking it over a medium heat until the chicken broth is saturated by the pasta, about 5 minutes. Garnish the pasta with the grated cheese and lemon basil.